Medical balls have a variety of clinical uses in medicine and dentistry, and they are most commonly known for stopping bleeding from wounds and incisions during procedures. There a multiple types of medical balls on the market, distinguished by their sterility, raw material, and of course, their clinical application. 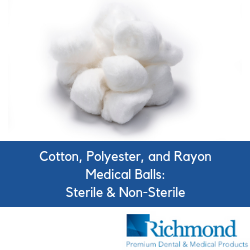 At Richmond Dental and Medical, we offer three types of medical balls for achieving superior clinical performance: rayon, polyester, and cotton. Not all medical balls on the market are sold as sterile. In order to achieve regulatory standards for sterility, medical balls must have received a specific dosing of gamma irradiation prior to final packing. Gamma rays are a form of electromagnetic radiation—like more commonplace x-rays—but with higher energy levels. Radionuclide elements, such as Cobalt 60, emit gamma rays during radioactive decay and comprise the primary industrial sources of gamma rays today. Gamma rays are effective at achieving sterility because they pass readily through plastics and kill bacteria by breaking the covalent bonds of bacterial DNA. Gamma irradiation achieves sterility through application in safe, well-defined, and controlled operating parameters. This process generates neither heat nor moisture. Thus, the medical balls undergoing gamma irradiation aren’t subjected to heat stress, nor condensate drainage, and the process doesn’t require outgassing. Most importantly, this process leaves no residual radioactivity. Now, let’s separate the medical ball market by fiber types and applications. Rayon medical balls are made from 100 percent rayon fiber, which is both soft and absorbent. These balls retain their shape whether wet or dry, for consistency in application. Rayon medical balls are virtually lint-free, uniformly-shaped, and soft, which is great for wound management. Rayon medical balls will also not cling to each other, making for greater ease and freedom of use in the clinic. These balls do not contain natural rubber latex, for hypoallergenic purposes, and they are available in sizes medium and large. While rayon is man-made, it’s not synthetic, but rather a natural fiber made from wood pulp. Polyester medical balls, on the other hand, are made from a synthetic man-made fiber derived from petroleum. As such, polyester balls are uniform in fiber length. They are non-fluorescent, while also non-absorbent, best used in a variety of applications where clinicians neither want to introduce nor extract moisture, keeping the tissue surface neutral. Like their rayon counterparts, polyester medical balls are available in medium and large sizes. Cotton medical balls, like rayon, are all-natural; however, cotton balls are also more eco-friendly than wood-pulp generated fibersand synthetics. Cotton balls are known for softness and high absorbency, as well as their ability to retain their shape consistently, wet or dry. They are made from 100 percent cotton fiber, meeting United States Pharmacopeia Standards (USP) for natural products. Further to their eco-friendliness, cotton medical balls are biodegradable, and no chlorine bleach is used in the purification process at the manufacturing facility of Barnhardt, Richmond’s parent company. Cotton medical balls are ideal for skin prepping and wound cleansing in the medical clinics, and for more cosmetic uses, they can be used to apply makeup, astringents, and cleansing lotions, as well as the removal of makeup and nail polish. As with other Richmond Dental & Medical balls, cotton medical balls are available in sizes medium and large. For more information on our range of medical balls for a variety of clinical applications, whether you need rayon, polyester, or cotton, contact us at Richmond Dental & Medical today.